Even though I’m not really a sports person and have no idea which teams are playing in the Super Bowl this year, I still want to offer a recipe for all you Super Bowl partakers out there. And, of course, it’s a healthier version of a party classic. 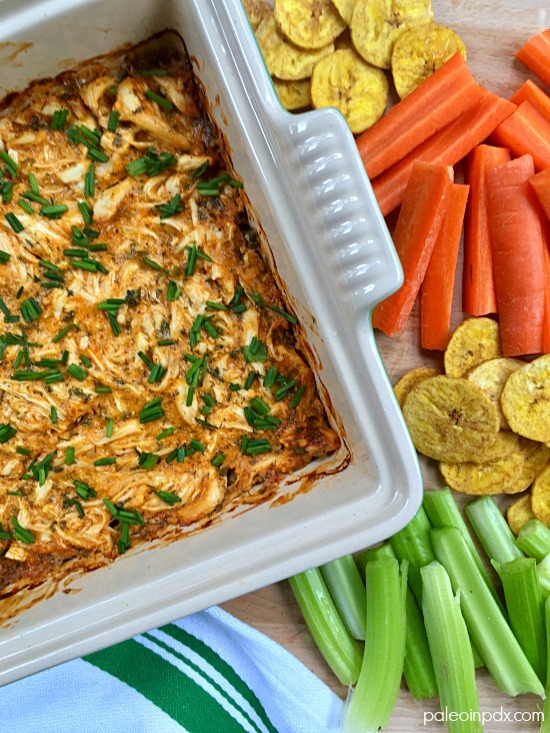 Enter: dairy-free buffalo chicken dip. Oddly enough, I’ve never had buffalo chicken dip and am straight up not a chicken wings fan either. With that said, this version of buffalo chicken dip was my first time ever having something of the sorts. And, I liked it…a lot! If you’re looking for other healthier versions of party food to share at your Super Bowl gathering, be sure to check out my spinach artichoke dip too. Also, I’ll be making this recipe on KATU Afternoon Live Friday, February 2nd! Watch the replay of my segment HERE. Add shredded chicken to a large bowl. In a separate bowl, mix together the mayo, hot sauce, and all the spices except for the chives. Pour over shredded chicken and stir to coat. Pour chicken mixture into an 8×8 baking dish. Bake in preheated oven for 40-45 minutes or until edges are bubbly and light brown. Garnish with chives and serve warm. Previous Post: « Golden Milk Cauliflower "Porridge"
This is perfect for Superbowl. Looks yummy.